Grandma’s Potato Salad is how I remember potato salad growing up. It has great texture combining creamy and crunchy and is the perfect summer BBQ side dish. 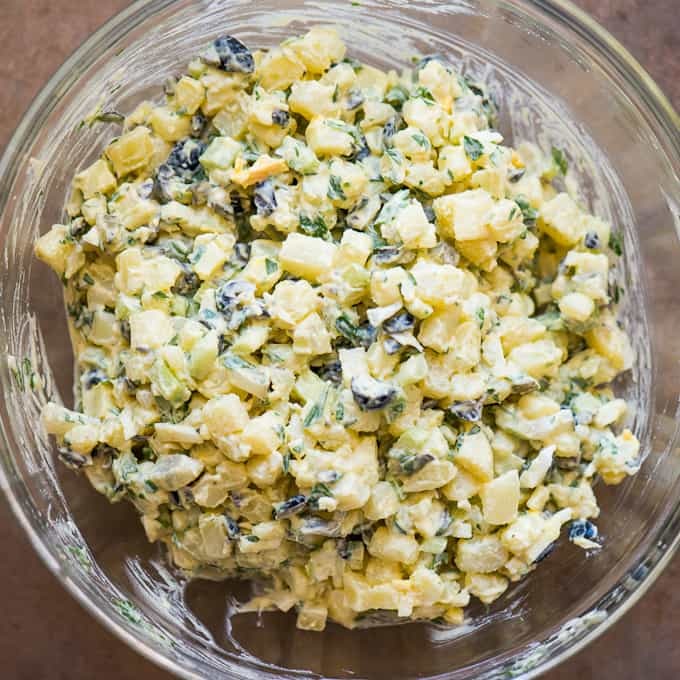 Its summer and what’s summer without potato salad? I made a big lunch of BBQ Pork ribs, corn, and this potato salad. I took a couple extra photographs so I could update the post. Since this was one of the first posts I had ever made, it’s pretty much been seen by no one, unlike my Granny’s Monkey Bread that’s been pinned a couple hundred thousand times, or my Salmon Patties that has a video with more than 10 million views, if you can believe it! I filmed the process while I was at it. Filming and editing recipes takes forever, but its what you gotta do these days! I’m getting better and faster with each one, but if you ever want to hear how much work they are, just ask and you can have the pleasure of listening to me complain for a solid 15 minutes. 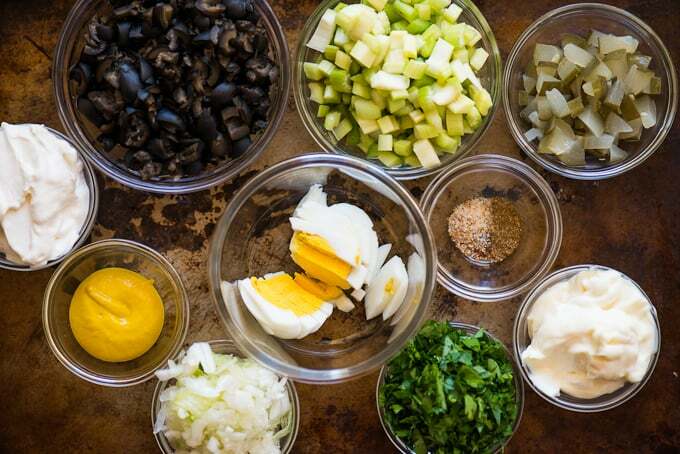 There are about a million different ways to make potato salad. What I’ve always done is to find a base recipe and tweak it based on what I have in my refrigerator and pantry as well as how much work I actually want to put into it. I only measured my ingredients this time so that I could give you an idea of how much I put in. 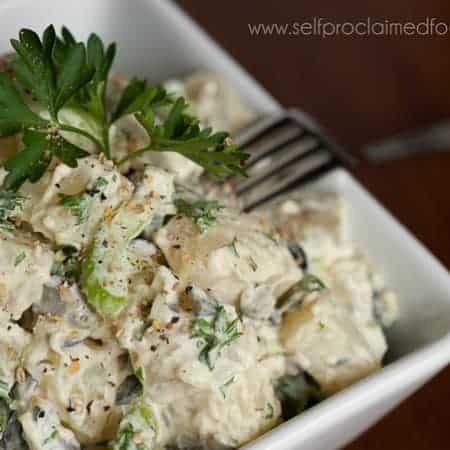 The way I really make potato salad, though, when I’m not going to post it on this blog is a scoop of this, a pinch of that, taste, a scoop of something else, a grind of this, stir, taste, and so on. The one trick I do urge you to follow is to grate the onion. When I eat potato salad, I am completely turned off when I bite into a large chunk of raw onion and then I offend everyone around me for the rest of the day. Not fun when you eat at an afternoon barbecue. That’s a long time to walk around with raw onion breath. By grating the onion, you incorporate that raw onion flavor without having to chew it. The chopped celery gives you that delicious crunch. The cornichons are, in my opinion, a great alternative to using something like relish because they, too, give a nice crunch. But unlike celery, their crunch is sweet and tangy. I may or may not have run out of cornichons in my ingredient photo above in which I may or may not have substituted with dill pickle. I tell you to add a large can of black olives. My husband and kids LOVE black olives and I’m pretty sure a few were stolen from the time I opened the can to when they got chopped and added to the potato salad. I used peeled russet potatoes because that’s what I had, but I much prefer red potatoes with the skin on. Moral of the story – have fun with your potato salad and feel free to change proportions based on your personal preference. Watch the recipe video below of me making my Grandma’s Potato Salad! Grandma's Potato Salad is how I remember potato salad growing up. It has great texture combining creamy and crunchy and is the perfect summer BBQ side dish. Chop potatoes into 1/2 inch cubes. Boil in salted water until tender but not mushy. Test frequently by stabbing with fork. Drain and lay out in single layer on clean towel to dry. In large bowl, combine remaining ingredients and stir to combine. Add potatoes and stir to combine just enough to ensure all ingredients are mixed. Be careful not to smash potatoes. Taste and add additional salt and pepper, if desired. Serve cold. Can be made ahead of time and even tastes better the next day. 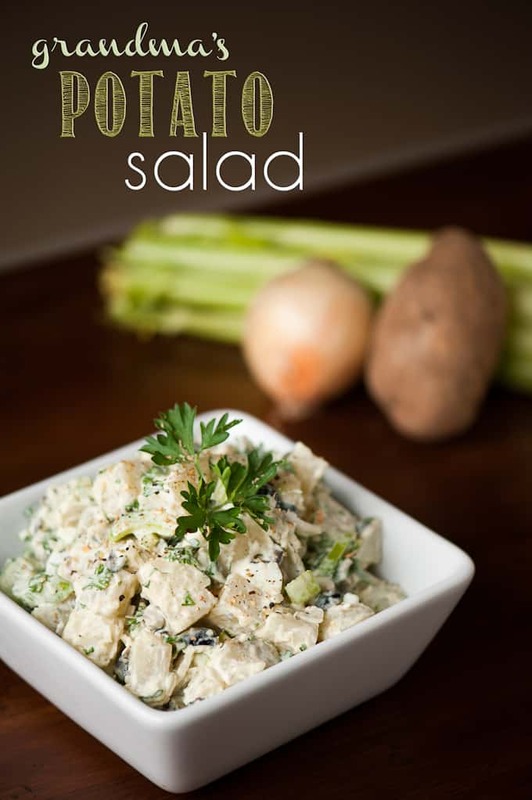 This potato salad looks delicious. I have pinned it to try it out on the weekend. Thanks for sharing this Krissy. It is so good .Got to make MOORE. Here’s a great article: http://www.foodrepublic.com/2013/06/05/what-is-a-cornichon/ If I don’t have them on hand, however, I just substitute with a firm dill pickle.